From Highway 101, exit onto East Blithedale (Mill Valley offramp). Continue past Longs and Whole Foods on the right. At the second signal, turn left onto Camino Alto, past Safeway, then a slight left onto Miller, where the school’s main parking lot is located, right before the football field. Park in the visitor slots. From the parking lot, walk up the stairs between Lower Keyser and Hoetger Hall, as shown in the map below. Then walk up the stairs to the right of the school wood shop. Tam Makers is in the Room 416, a yellow stucco building at the top of the hill, between the ceramics, photo and music buildings. 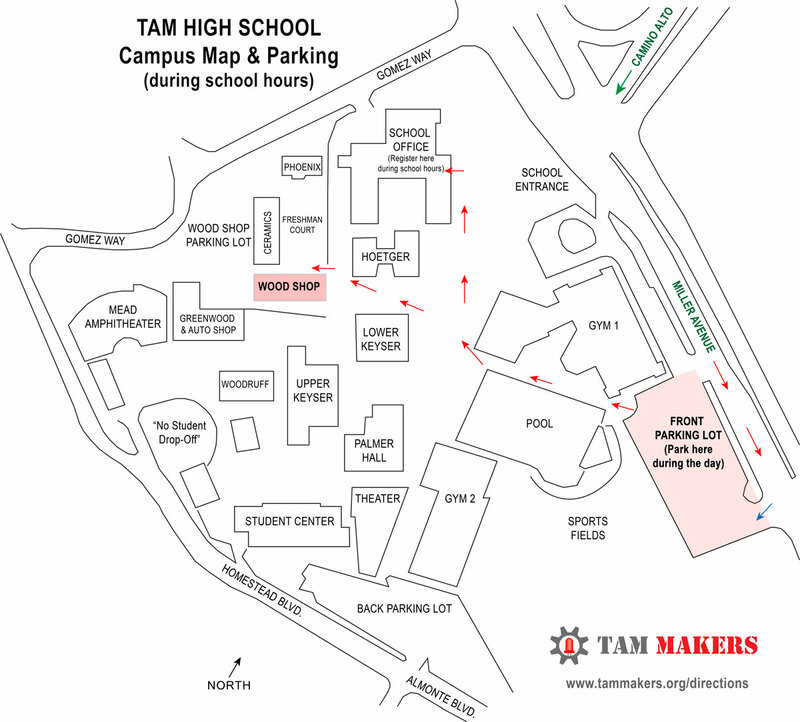 If you are coming in during school hours (7:30am to 4pm), please register first as a visitor in the school office at the top of the stairs at the campus entrance, as shown in the map below. If you are lost, email info@tammmakers.org and/or ask for Geo Monley, who runs the shop. See campus map below, with walking routes shown in red. Note that if you have signed up for a class that takes place outside school hours, after 4pm on weekdays — and on weekends, you can park by the wood shop, following these after-hours directions instead.